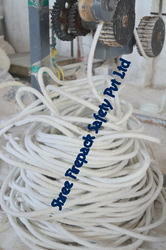 Pioneers in the industry, we offer ceramic fiber round ropes from India. shree firepack safety pvt ltd offer Ceramic Fiber Braided Round Square Ropes are manufactured from superior quality Ceramic fiber yarn, braided cover on cover to form a solid packing. ceramic fiber ropund ropes is suitable for caulking and general thermal insulation application, with properties of low thermal conductivity. The yarn is reinforced with ASTM grade E-Glass Filament can withstand very high temperature. This packing is available in various sizes from 8mm to 60mm or above on request. Applications: Superior replacement to Asbestos packing, static/door seals in boilers, stoves, ovens, reformers, chemical/glass/coke furnaces, kiln cars seals, expansion joints in buildings industries, radiant tube packing for heat treat furnaces, seals for boiler sections, heat exchangers thermocouple tubes, dummy bar seals, insulation of pipelines, vessel etc. We are also Exporting to Middle East Countries, African Countries European Countries. Looking for Ceramic Fiber Round Ropes ?